Zenith... You Won't Find Another Bass with These Features! 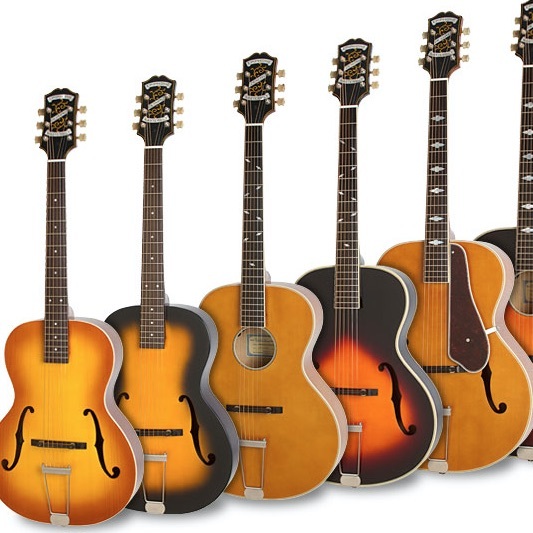 Since 1873, Epiphone has been designing and making some of the most innovative and classic instruments including the Emperor, Broadway, Casino, Wilshire, Coronet and WildKat - just to name a few. The all new Epiphone Zenith Bass features classic design styling with an elegant profile that pays tribute to great Jazz guitars of the past. It's gypsy style cutaway provides easy access to all frets while it's F-holes and upright style tailpiece pay homage to Epiphone's acoustic basses of the past. 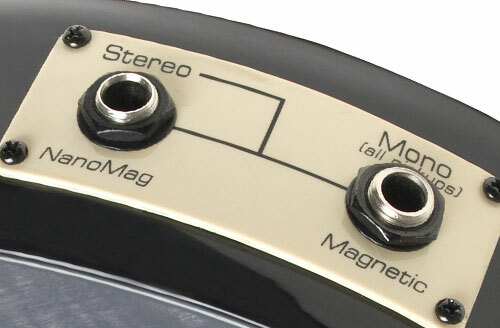 Stereo Electronics: At the heart of this bass is the revolutionary NanoFlex(TM) and NanoMag(TM) pickup combination. Custom-made for this bass by Shadow Germany, these pickups provide a wide range of tones suitable for almost any type of music. Under the saddle, the NanoFlex senses the vibrations of the strings AND the body of the instrument simultaneously. Not a piezo, this exclusive, low-impedance 7-layer element has active electronics and 100% shielding to ensure no sound is lost and no hum is introduced. 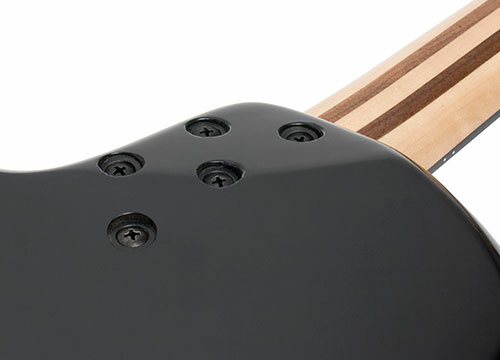 The NanoMag is located right at the end of the fingerboard - just like in Epiphone's award-winning Ultra-II guitar. Positioned at this sweet-spot, the NanoMag captures all the subtle nuances and harmonics of every string. Like the NanoFlex, it too is low-impedance with active electronics on-board but it features a tiny air-coil, 3 samarium-cobalt magnets and silver-platinum shielding for a hum-free output. Both pickups are controlled by an active electronic system featuring a Master volume, pickup Blend and individual bass and treble controls for each pickup. The Sound: You will find that this bass offers some deepest and warmest bass tones to be found on any bass as well as all of the bite and punch you would want for whatever you musical style may be. It provides a lot of acoustic properties, while not being subject to feedback issues so common to other acoustic bass guitars. And with stereo outputs, the pickups can be summed together (mono) or split (stereo) using standard 1/4" cables. This feature opens up excellent recording opportunities as well. Acoustically Chambered Body: Also unique to this bass is it's construction. 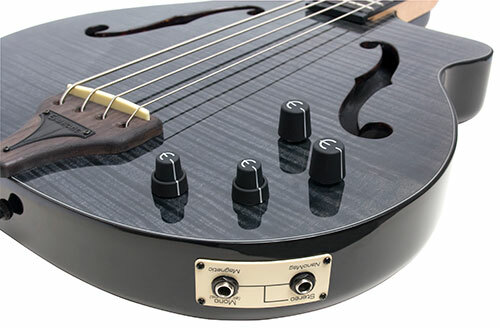 A cross between a solid-body and a semi-hollow bass, the body is computer-routed to create acoustic chambers. The top is laminated Flame Maple with tortoise bound "F" holes. The 5-piece, satin finish neck features a combination of Hard Maple and Walnut. It's attached to the body with a deep-set, 5-bolt design that holds it solidly in place and adds to it's deep, rich tone. 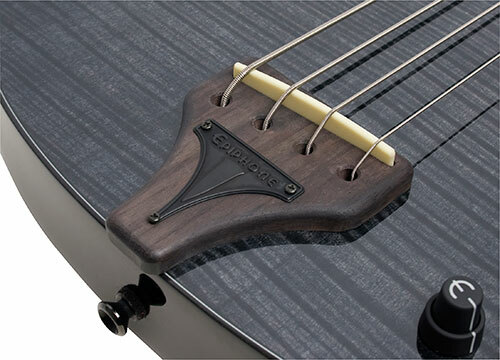 Another unique feature of this bass is the bridge. Drawing inspiration from Epiphone's upright bass models of the 1940's and 1950's, it features a solid Rosewood tailpiece with a replica of the historic Epiphone triangular metal badge. The strings go over the fixed saddle and through the body which adds even more tone and sustain. Other features include a comfortable "belly-scarf" on the body, premium die-cast 14:1 bass tuners, tortoise multi-binding on the body, an easy access 9V battery compartment and under-stated black hardware. Choices: The Zenith is available in a 4 string fretted version and also a "lined" 4-string fretless version that comes standard with LaBella 760N Black Nylon tape wound strings for some great upright bass tone properties. Unique in so many ways, this new Zenith bass lends itself well to many musical styles including modern unplugged rock , Americana, Blues, Jazz, Country and Bluegrass making it a powerful and creative addition to your bass arsenal. 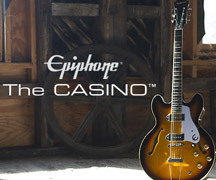 Backed by Epiphone's Limited Lifetime Warranty and Gibson's 24/7/365 Customer Service, you can't go wrong.